I attended the Ignite event last week in Fort Lauderdale. 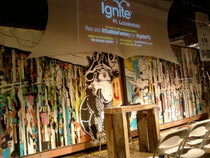 Ignite is an event that happens in various cities across the world. It spans about a week. Speakers are given 5 minutes and 20 slides to talk about their subject. It is a fast paced way to create discussion. The theme of the Fort Lauderdale event was Creating a Creative Community in Fort Lauderdale. Fort Lauderdale has an budding art scene, however it is not as prominent as Miami's art scene. There were many different ideas that were discussed by the speakers. Ideas about networking, cultivating a creative economy. There were examples for creatives reaching out into the community to build communication and trust with the public. The most prominent idea that stuck in my mind was the idea that creativity is based on risk. Creativity thrives and is willing to take risks when surrounded and supported by a community that loves and supports it. This idea can be expanded from one's personal experience to any other area that we interact with. It can start with our family and friends and extend into the workplace. Our interaction in social networking sites can also cultivate a space for sharing our gifts with those that love and support us. This support boosts confidence and allows us to take risks. Risks can lead to innovations and different levels of expression. Artists are a critical part of the community. They create culture and taste. Artists have the special ability to respond to the cultural needs of the community. Together with the community that they interact with, artists can create real and lasting change.